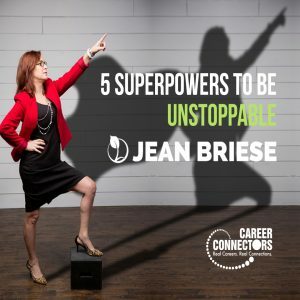 Jean Briese is extraordinary in her field. She is an award winning business leader, as well as Arizona’s highest ranked and most reviewed motivational speaker and business coach. She speaks and blogs about leadership, high performing cultures and empowering women, and she is the executive director and founder of a non-profit for families of law enforcement officers. 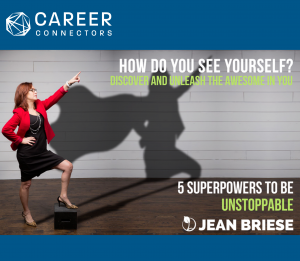 Jean has identified five moves, or superpowers, that are shared by all those who are extraordinary in their field. She also provides practical ideas that we can use to become extraordinary and unstoppable. When you are your best self, you are unstoppable. Michael Phelps credits his Olympics success to his habits. He has banished the words, “I can’t.” He also realizes the power of visualization. He visualizes obstacles in his way or competitors beating him, and visualizes how he fights back to regain the lead. How do you start your day? We are what we repeatedly do, so make sure you start your day in a positive, proactive way. Go to the gym, meditate, pray, enjoy nature. Looking at email or social media is reactive and negative. Responding to email makes us think we are busy, but we are not being productive. Instead, schedule time for your non-negotiables and time to check your email throughout the day. Also, consider removing the notifications from your phone. Adopt a growth mindset. If you’re doing things the way they’ve always been done, then nothing will change. Take a look at your daily life and figure out your best habit. See how you can improve and banish those negative thoughts. Also, consider spending a portion of your time and/or money in helping others – life gets better when you do. Zig Ziglar said, “You can have anything you want as long as you help enough other people get what they want.” Don’t wait for the future. Each of us has been given gifts for a specific purpose. Do you know your gifts? Send an email to 5-7 people and ask them to share your top 3 strengths and 1 thing you can improve. Be aware of your weaknesses, but don’t focus on them. Now pick one strength that speaks to you and become amazing at it. Look at the things you are passionate about, and you will find your purpose. A belief is an acceptance that something is true. We have limiting beliefs that aren’t always true. Some common beliefs are “I can’t,” “What if I fail,” or “I’m not ____ enough.” You can fill in the blank. These things may not be true, but these limiting beliefs lead us to that conclusion anyway. You can use visualization in your struggle with limiting beliefs. You can be like Michael Phelps, who imagines competitors taking the lead in the pool and what he does to take that lead back. Once you visualize a limiting belief, imagine instead that you will not fail and see how your vision changes. You can’t make the journey alone. We need to be encouraged and we need to know when we have gotten off the path. You’ve heard the saying, some people are blessings and some people are lessons. We rise and fall to the level of our relationships, so figure out who you need to meet and who you need to learn from. Surround yourself with your “woo hoo” crowd. Find a mentor. If you’re going to do something you’ve never done, there will be naysayers. Ignore the naysayers! Fear is the #1 reason we do not take action. You always have a choice in how to proceed, even if the choice is only your attitude. If you don’t know your choices, brainstorm with friends, colleagues or your mentor. Above all, give yourself permission to fail. Failing is how we learn. Commit to one goal and act on it within 24 hours. Once you do that, you are on your way to becoming unstoppable. PrideStaff is a locally owned and operated staffing agency with temporary, temp to hire, and direct hire placement opportunities. They are focused on finding out your needs and making good culture fits with you and their clients. They even offer benefits that can begin after 8 hours of employment with PrideStaff. Examples of current positions include Administrative Assistant, Accounting, Inside Sales, Customer Service Rep, and Collections. For current job openings, click here. The company is growing quickly, and looks to increase its sales staff from 30 people to 100 by the end of June for a single client. For additional job openings, go to https://www.ttecjobs.com/en-US/search. Go to the Freedom Financial site for a complete listing of current open positions. Go here for a complete list of openings. Don’t miss our upcoming West Valley Healthcare Expo on Thursday, May 17 at the Avondale Sports Center. This event is a collaboration of all major healthcare organizations in the Phoenix West Valley to connect future and current workforce with employers and education opportunities. To register or for additional details, click here. Also, be sure to check the schedule for the dates of upcoming events at careerconnectors.org. A few dates have been moved to accommodate summer programs at our host locations. Life is about transitions. Some transitions in life are planned and generally welcome: graduation from high school and going to college, moving into a new house, or bringing home a new baby. Other transitions are sudden and often unpleasant: recovering from the damage from a storm or the death of a family member. Regardless whether the transition is planned and welcome or unplanned and unpleasant, in both circumstances dealing with the transition will be a struggle to varying degrees. How can a jobseeker overcome his or her struggle to gain new employment? 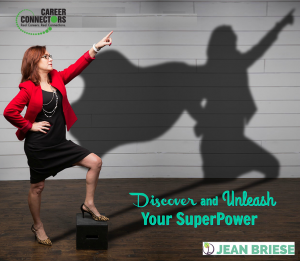 By recognizing and utilizing the “superpowers” of the jobseeker. Superman uses flight, the Hulk uses strength, and Wonder Woman uses her lasso to fight against bad guys. Jobseekers using their superpowers can turn the inevitable struggles of career transition into opportunities for growth and success. • What is your best habit? • What habit should you change? • When was the last time you implemented a new habit? Jean encourages jobseekers to develop habits that are productive to a job search and eliminate habits that are detrimental. There are over seven billion people in the world. One can easily feel lost or insignificant among such a large number. But Jean countered that everyone has a unique combination of traits, skills, gifts, and experiences that can be used for each individual’s unique purpose. Jobseekers should spend time thinking about their unique gifts and purposes and be able to articulate their passions. Look to others for assistance. Send 5-7 people who know you well an email asking for your top three strengths and where you have room to improve. From the answers provided pick a common strength and make it your focus for becoming an expert. Don’t focus on the “weakness”, just be aware of it. 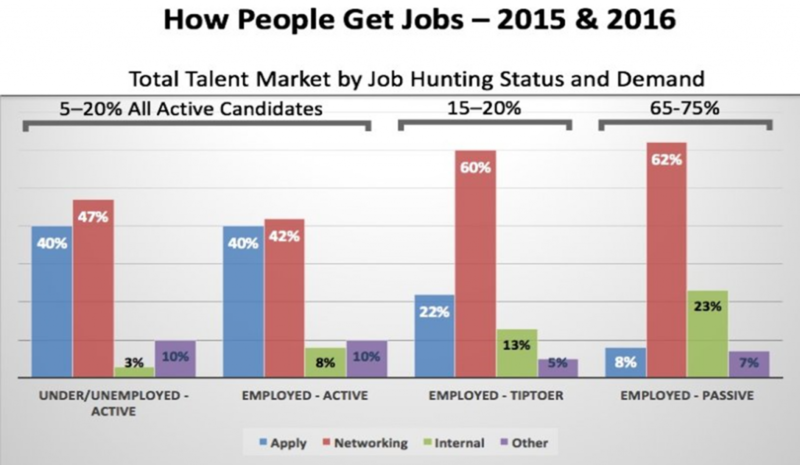 A jobseeker’s beliefs can have a significant impact on behaviors. Self-limiting beliefs promote fear and can inhibit a jobseeker from taking positive actions. Usually we obtain a self-limiting belief because our perceptions lead to a conclusion that reinforces the belief. For example, a jobseeker who gets passed over after a first interview might perceive he performed poorly in the interview. He may then make a broader conclusion he “does not interview well” to such a degree that he takes this belief to future interviews and reinforces, consciously or subconsciously, his conclusion with defeating behaviors. But look at his situation from another perspective. Perhaps the interviewer had already chosen her preferred candidate but HR required her to meet other applicants. Perhaps the company didn’t hire anyone and revoked the position entirely. The candidate doesn’t see these other reasons. He perceives only that he doesn’t interview well. Eliminate the potential for such conclusions and the creation of self-limiting beliefs by seeking the perceptions of others to make other conclusions. Throw out self-defeating beliefs by getting a new perspective. 1. Mission – Show up to a networking event with a plan. Research the event to find specific people to meet. Set a number for how many people you intend to meet. When talking to people, remember networking is not selling. It’s about building relationships. Take interest in helping others. A suggestion for introverts or others uncomfortable with approaching strangers: volunteer at the networking event. You can strike up conversations in your “official” capacity as a volunteer. 2. Engage – Effective networking means attracting people who you want to know, like, and trust. Increase your odds of attracting such people by dressing well, smiling, and being authentic. You know how sometimes your computer starts to run slow and take forever to boot up? Many times that is because of some bug you may have downloaded. The same thing can happen to corporate computer networks. I help companies keep their IT environments running quickly, efficiently, and securely. 4. Tend – A single conversation at a networking event isn’t enough. Cultivate the relationship and follow up with the connection. Send a note to those you would like to meet again. Ask for a face-to-to-face meeting for lunch, coffee, or whatever is convenient. Moreover, keep meeting that person. Perhaps once a month. Stay in touch and build the relationship. Only ten percent of people take action. Why such a small percentage? Jean states that fear is the biggest reason. The common root of many fears of jobseekers is the fear of rejection and a realization of the struggle to overcome. Avoiding the struggle can lead to stagnation and may even be harmful. Jean told a story about caterpillars she kept to watch them turn into butterflies. She and her family watched each caterpillar engorge on food, form a chrysalis, and emerge as a butterfly. She noted how the newly formed butterflies struggled greatly to break free from their respective chrysalis. In one instance a concerned family member tried to help the butterfly by breaking apart the chrysalis. They noticed afterward the butterfly had a problem with its wing. Not damaged because of an accident during the assisted emergence, but because the struggle to break out of the chrysalis strengthens the butterfly’s wings so that it can fly. The struggle is necessary for growth. Similarly, jobseekers should not remain paralyzed with fear but embrace the struggle to transition to a new employer by using their superpowers. MUFG is a global financial services company based in Tokyo. The firm and its Union Bank subsidiary will expand operations in its Tempe location with 200 new positions supporting bank operations. Diversity and inclusion are important to the culture. Open positions include Risk & Control Manager and Consumer Lending Data Analyst. Get further information and apply directly on MUFG’s website here. Cognizant is one of the world’s largest Business Process Outsourcing (BPO) companies. Headquartered in Teaneck, NJ, Cognizant has nearly 260,000 employees worldwide and is number 205 in the Fortune 500 for 2017. Cognizant has strong benefits that start the first day of employment. Open positions include Business Analyst and Product Managers. Cognizant also has several urgent, immediate openings for Social Media Content Specialists. Get further information and apply directly on Cognizant’s website. You can learn more about Staff Logic and open positions by clicking here. New Horizons offers training and certifications in IT, office management, healthcare records management, and project management. Joe recommended those considering such training should consider alternative sources of funding: VA educational benefits, employer tuition assistance, vocational rehabilitation, WIOA grants, Trade Adjustment Assistance, and military spouse grants. Contact New Horizons for details on their programs and options for funding.